I don't think Dr. Chadbourne was sacked because Ryan was annoyed with his statement to PIC. I think Dr. Chadbourne went to see Michael Costa over Mr. Ryan's head and referred inappropriately two senior police who I think Mr. Ryan had not seen fit to have the same understanding of and in fact believed they were at the very least unsuitable. DT article 22 March 02 Priest quits advisory job. Priest "some dangerous and considerable enemies and those people are still in senior positions in the Police Service." Priest has no question as to the dangerousness of some senior police? The same police who broke up the reform committee? Dr. Chadbourne was marched out by Ryan like a criminal. Perhaps a corrupt head of Police Human Resources wasn't the reform Mr. Ryan wanted in his new vision. Ryan may have become annoyed as to many complaints from these senior police towards alleged behaviour of the reform unit frustrating Ryan and hence his eventual sacking of that unit. Because it appears that the reformers ought to have been the apple in Ryan's eye. That is where the Carr Government comes in as saboteurs Carr, Debus, Whelan, and now Costa. Personnel used to stitch it up? Former police commander Clive Small and deputy commissioners Dave Madden and Andrew Scipone. Dangerous? Believe it or not someone has to make out the truth in this otherwise secret service. Carr drags Small in so he can put him back as Commissioner after Ryan's demise and Costa becomes the saboteur. Mmm. 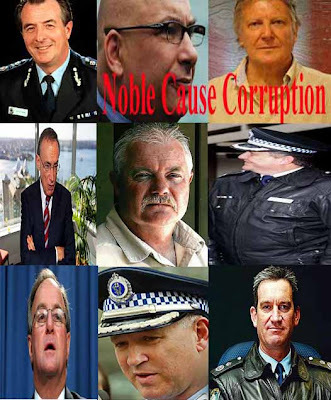 That of course could mean the Carr Government has successfully stacked the deck from Police Minister all the way down to Commissioner and on to Deputy Commissioners Ken Moroney, Dave Madden and Andrew Scipone. ED: I could be wrong. Who vows to tell us the truth?